As a child, I loved Roald Dahl for the reasons all his fans do, for his inventiveness, for the integrity of his worlds, for his readiness to admit to children what they already know: that there is such a thing as cruelty. I thought about Dahl again recently while reading the work of his once-classmate, Denton Welch. Born a year before Dahl, Welch spent his childhood shuttling between England and his father’s work in China. At twenty years old, he was struck by a car and left with a fractured spine and chronic pain. Convalescing, he came to see his past as more alive than his future, and he spent the years until his death at 33 exploring that past in autobiographical novels and short stories. His writing is quiet at first glance, careful. The narrators pay an inordinate amount of attention to antiques and to the decorative flourishes on gates and churches. Considering this, the books should not be page-turners, and yet they are. An ephemeral, everyday experience like unjustified anger is described offhandedly, but down to its essence, so that the reader feels recognized and reads on. Wanting to know more about Welch, I picked up what I could and, unhappily, discovered this: “Dahl would catch him and twist his arm behind his back until tears came. He also applied Chinese burns to the skin of Welch’s wrist. The rest of us stood and watched; we were all a little frightened of Dahl.” This according to a classmate of Welch and Dahl’s at Repton School, a prestigious boarding school in Derbyshire, England. I knew a little already about Dahl’s imperfections, that the knowledge of cruelty displayed in his books may have come from his participation in it. He was on record as an anti-Semite and has been accused of misogyny. Now I was considering a new word after anti-Semite and misogynist, which perhaps should have been obvious after the other two: bully. Learning about Dahl’s preoccupation with and proclivity for bullying I had one more window into the darkness of a writer I cared about as well as into the pain of another writer I had come to care about. But Dahl himself was not always a bystander, at least when it came to Welch. According to classmate David Atkins, “Dahl was sometimes protective, but also enjoyed hurting him.” He made a “determined grab” for Welch’s crotch on the first day of school, and an English teacher, who may have noticed it, embarrassingly assigned Dahl the part of Romeo and Welch the part of Juliet in a classroom reading. Dahl’s occasional protectiveness must have been confusing to Welch; the switch in mood is as disorienting as a threat. But it’s very possible Dahl’s affection was genuine. Dahl’s biographer notes that Welch had an outsider status that Dahl may identified with and even respected. There are two brothers in Brook House called Welch, and one did not want to come back to school, so at the station he told his bro. that he was going to buy a paper. But he didn’t return. And no one knew where he was. The truth of the matter was he had bottled & taken a train to Salisbury, where he went to a cousin aged 63 & told him a pack of lies. The next day, he went to Exeter. He had to pawn his watch to get money & was found by a Policeman wandering about in the streets of Exeter at midnight with tenpence in his pocket. He slept the night in a cell. He is now back at school, & seems quite happy!!!! Here, a fifteen-year-old Dahl narrates the events that would make up the beginning of Welch’s first novel, Maiden Voyage. Welch did indeed decide to visit Salisbury and spend the night in an Exeter jail rather than go back to school. 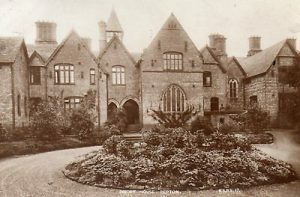 Repton was as grim for Welch as it was for Dahl (perhaps, in part, because of Dahl). “Every morning when I woke up and remembered where I was, I felt something draining out of me, leaving me weak,” Welch wrote. There was another boy in the school while I was there who was later to become a writer like me. His name was Denton Welch, and a fine writer he became. He wasn’t in the same house as me, so I never got to know him, but every day I used to see Denton Welch walking to class all on his own, a tall frail bespectacled boy who looked totally miserable. He must have had more courage than me, or possibly less tolerance, because he refused to put up with it all. One day he escaped and ran away and never came back. The note about courage is interesting. I wonder if Dahl, who lived his whole life thinking about the violence at Repton School, regretted not running away himself. And I wonder if he felt some shame upon realizing that the boy he bullied may have been stronger and more resourceful than himself. Perhaps he knew this all along; perhaps it is exactly why he respected Welch and why he bullied him. 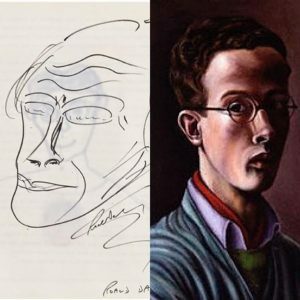 Likewise Welch, who only wrote autobiographically, did not take up the label “autobiography.” Some people and places appear in his work undisguised, like Repton for example, while others are altered. In some instances you would have to be Welch himself to know if a story were true. But the work was almost always billed as fiction. He sifted his past through his imagination. 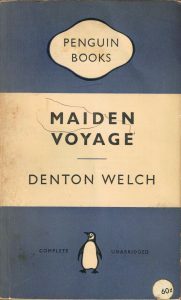 Still, even if neither Welch nor Dahl were committed to fact, one reads Maiden Voyage and Boy as if they were simply because of how well the books are written. And since the characters bear their author’s names, it is tempting to feel as if one knows the authors, only to be shocked later—as I was—by facts that fall outside the work. It is tempting also, after the shock, to go back and try to put the pieces together. But reflecting on Dahl’s bullying, one confronts questions without answers. What inspired his bullying? Things he witnessed or things he simply was? What inspired his fiction? The same? It is enough to take from an investigation into Dahl’s bullying merely an invitation to read Welch. 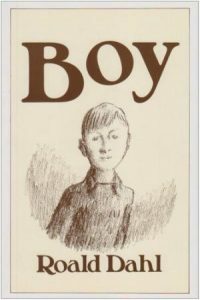 For those who haven’t read Boy, I recommend it. But for those who haven’t read Welch, I recommend Boy’s courageous twin, Maiden Voyage.